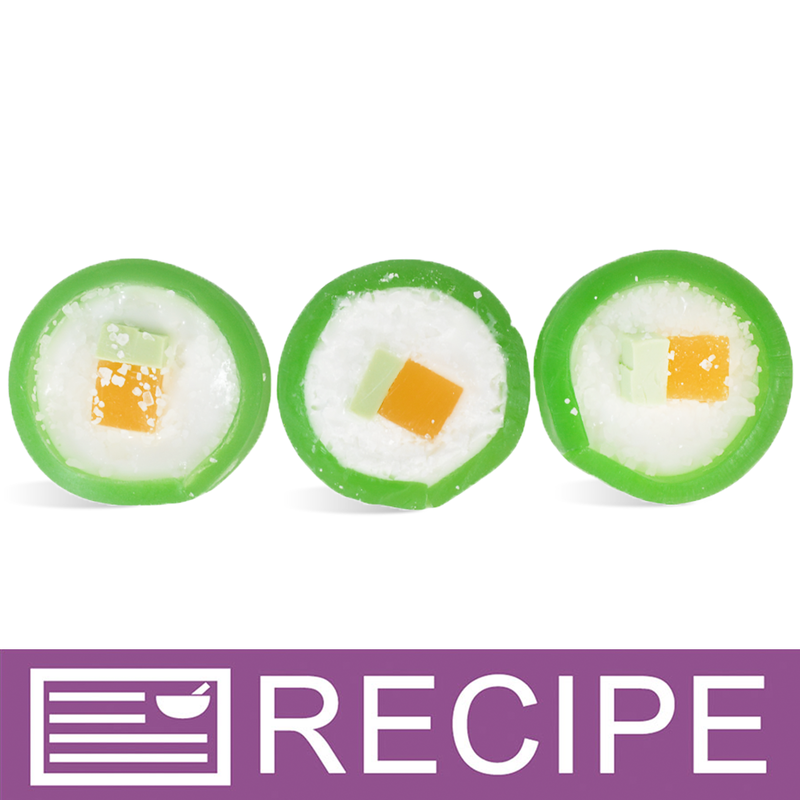 gives each soap a ricelike texture making these guest soaps a fun project for any sushi lover. INCI Ingredient Label: Sorbitol, Propylene Glycol, Sodium Laureth Sulfate, Stearic Acid, Water, Sodium Hydroxide, Sea Salt, Myristic Acid, Lauric Acid, Sodium Hydroxide, Sodium Cocoyl Isethionate, Glycerin, Fragrance, Methylparaben, Propylparaben, Diazolidinyl Urea, Yellow 6, Green 5, Yellow 5. To mix & pour funnel, add 14 oz. clear soap, 0.55 oz. green color bar, and 0.20 oz. white soap. Melt in microwave. Stir well to incorporate color, add 1 oz. of fragrance oil and then pour into silicone jelly roll pan. Spray with alcohol and set aside to harden. In a beaker, add 1.3 oz. clear soap and 0.20 oz. white soap. Melt in microwave. After soap is melted, add four drops of sunflower orange liquid color and stir well. to harden. This is your 'tuna' for your sushi. While that soap is hardening, cut green soap in jelly roll pan into strips that are 6.28 inches long and 0.6 inches wide. 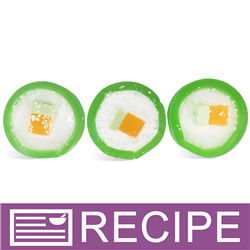 Line the cavities of the round guest mold with these strips of green soap to form 'seaweed' for your sushi. Remove your orange colored soap from the mini mold and cut into 0.6 inch pieces. In a beaker, add 1.5 oz. white soap and 0.15 oz. green color bar. Melt in microwave. Stir well. harden. This is your 'cucumber' for your sushi. After soap is cooled, cut into 0.6 inch pieces. Then cut each of those pieces in half lengthwise. Place one piece of the orange soap and one piece of the light green soap in each cavity of the soap mold. In a beaker, melt 3 oz. white soap. Add 0.50 oz. fragrance oil and stir until soap reaches 120ºF. Spray the soap in the mold liberally with alcohol and then carefully pour white soap into the cavities taking care to not pour over the orange and green soap. Do not fill the mold to the top with soap. Leave some room so the orange and green soap stick up. 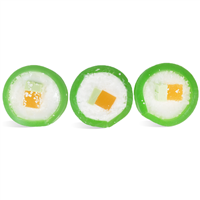 After filling all the cavities and while the soap is still warm, gently sprinkle the top of each soap with salt to look like rice.